The United States is in a jobs quandary. The pace of hiring has slowed in the last few months, yet there are millions of openings going unfilled. Federal Reserve Chair Janet Yellen told Congress on Tuesday there is an imbalance between less-educated people looking for work and more skilled positions that are available. The United States added an average of 200,000 jobs per month during the first quarter of 2016. That fell to 100,000 in the first two months of the second quarter, adjusted for a Verizon worker strike that ended at the end of last month. The unemployment rate still fell to 4.7 percent in May, partly because labor force participation slipped. Even so, there were 5.8 million open positions at the end of April. Among them, there are more than 223,000 software developer jobs with average pay above $104,000 a year, the App Association said on Tuesday. About 209,000 jobs in cyber security went unfilled in 2015, a sector which Ernst & Young says could face a shortfall of 2 million workers by 2020. Many of the people who need jobs don’t have the résumés to fill these openings. Minorities and the less educated have been hit hardest as the U.S. economy has shifted toward industries needing more skilled staff. Yellen noted that African-Americans and Hispanics suffer from a higher jobless rate than the general population. In 1964, 97 percent of men between ages 25 and 54 with a high school degree or less were in the labor force. That figure fell to 83 percent in 2015, according to a White House report. While the Fed has a mandate to boost job creation in the big-picture sense, by most estimates the current unemployment rate reflects something not far from steady-state full employment. When it comes to addressing training and education needs to help more people qualify for open jobs, it’s down to lawmakers. The latest White House budget, under consideration in Congress, allocates about $2 billion to encourage companies to hire more apprentices who can learn on the job. Elected representatives may take inspiration from Yellen or from broader concerns about inequality. Either way, only they can pass legislation that targets specific groups for help and incentives. 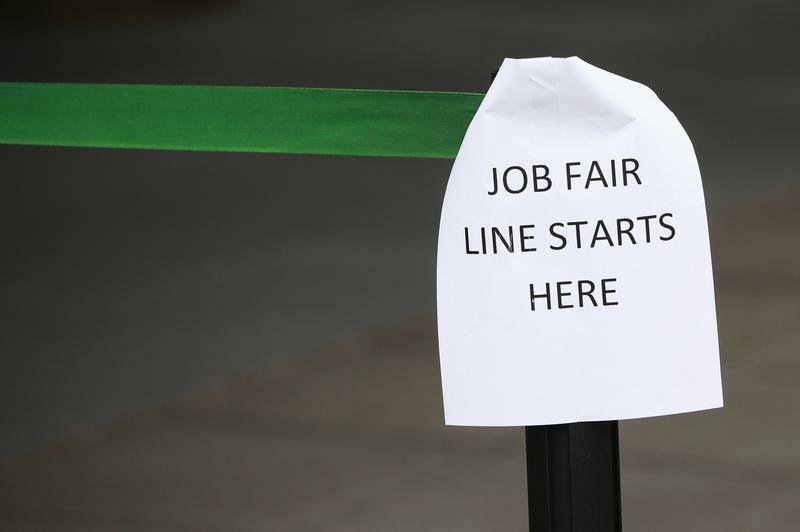 A sign marks the entrance to a job fair in New York October 24, 2011. As part of her monetary policy report to the U.S. Congress, Federal Reserve Chair Janet Yellen said on June 21 that there is a “certain degree of mismatch” between the kinds of people who are looking for work and the job openings that exist. During the first quarter of 2016, Yellen said the United States added an average of 200,000 jobs per month. She said that rate fell to 100,000 per month in April and May when adjusted for a Verizon worker strike. There were 5.8 million unfilled positions as of the end of April, the Labor Department said earlier this month, similar to March. The App Association issued a report on June 21 that said there are more than 223,000 unfilled job openings for software developers, each paying an average salary of more than $104,000 a year. The White House released a report on June 20 that showed the labor force participation rate of men between ages 25 and 54 has fallen in the last 60 years, with the less educated being hit the hardest. In 1964, men in that age group with a high-school degree or less had a 97 percent participation rate, but that fell to 83 percent in 2015.